The International Finance Corporation (“IFC”), as a legally and financially independent member of the World Bank Group, aims to end extreme poverty worldwide and enhance financial prosperity by providing capital and guidance to private-sector entities in developing countries. The IFC has an advanced and much-admired Sustainability Framework that imposes “due diligence” obligations on its clients in relation to social and environmental risks by means of eight Performance Standards. Nevertheless, the IFC has been the target of significant criticism owing to the fact that many of its projects have been implicated in serious human rights violations. This report argues that serious human rights abuses of this kind have occurred because the current Sustainability Framework does not adequately integrate consideration of human rights into the IFC’s due diligence processes. The report begins by outlining the obligations of international organizations, and specifically of the IFC, under international human rights law. It explains how these human rights obligations can be satisfied by adequate due diligence and how, conversely, lack of adequate due diligence with respect to human rights risks constitutes a violation of international human rights law. 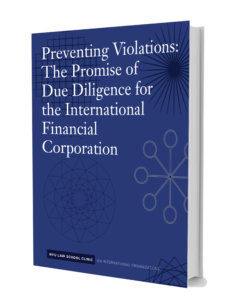 The report moves on to identify shortcomings within the IFC’s current due diligence practices and proposes a method for incorporating human rights considerations into these due diligence practices. With a view to highlighting the importance of an adequate assessment of contextual and sector-specific human rights risk information, this method is exemplified in relation to a case that has received much criticism: the IFC-funded Dinant palm oil plantation in Honduras. The International Organizations Clinic assists students in developing a fuller set of skills required to address increasingly complex global (i.e. both international and transnational) problems.